Robert de Hilster is an Amercian scientist and electrical engineer best known for his work in digitial switching systems and his more recent work on gravity models. He is the author of two books including one on gravity entitled Gravity is Not Free and a second book Universe Hack 3.0 which is based on the Particle Model developed by himself and his son David de Hilster. Robert also played a major role in the feature-length documentary film Einstein Wrong - The Miracle Year (2005). Robert "Bob" de Hilster was born on August 21, 1937 in Wyndotte Michigan to a Dutch father, and an American mother. Bob went to a Luthern school through 10th grade when he attended Wyndotte High School in Michigan where he met his future wife Pat de Hilster. 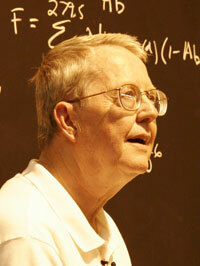 In 1957, he married Pat and moved to Ann Arbor Michigan where he obtained an engineering physics degree. While in college, he and his wife had their first son, David de Hilster. Robert de Hilster worked as an electrical engineer in research for over 40 years, specializing in the area of telecommunications in which he holds several patents. He worked on one of the first large commerical computers, the Remington-Rand Univac. He worked over twenty years for North Electric in Ohio developing digital switching systems. Robert then worked for another 20 years for Itec in Huntsville Alabama working again in the area of telecommunications. Robert has written a book on gravity called Gravity is Not Free and is currently co-authoring the book Universe Hack 3.0 with his son David de Hilster describing what they call the first complete physical model of the entire universe based on the Particle Model. Bob continues to use the basic ideas from his gravity equation and has applied it to circuit theory. It should also be applicable to other areas of physics. In late 2017, Bob started a YouTube channel The Particle Guru where he makes videos describing various aspects with the Particle Model. Bob is widowed and has four children: David, Karan, Laurie, and Michael. He is retired and currently lives in Boca Raton Florida near his first son David. 2015 - "Gravity is not Free"
2018 - "Dark Matter Versus G"
2016 - "Special Relativity is Not Needed"
This page was last modified on 13 February 2019, at 12:58.